In the fall of 1972, during my junior year of high school, I sat down at the Cable-Nelson piano in the basement of my parents' house and laboriously penned my first song, "Last Airport Home." A few days later, I wrote another, and then another -- and then another. . .
Then, in January, 1976 I played a borrowed Wurlitzer electric piano at the Wakonda Country Club on Des Moines' South Side with a band called Now and Then. That was my first professional gig. 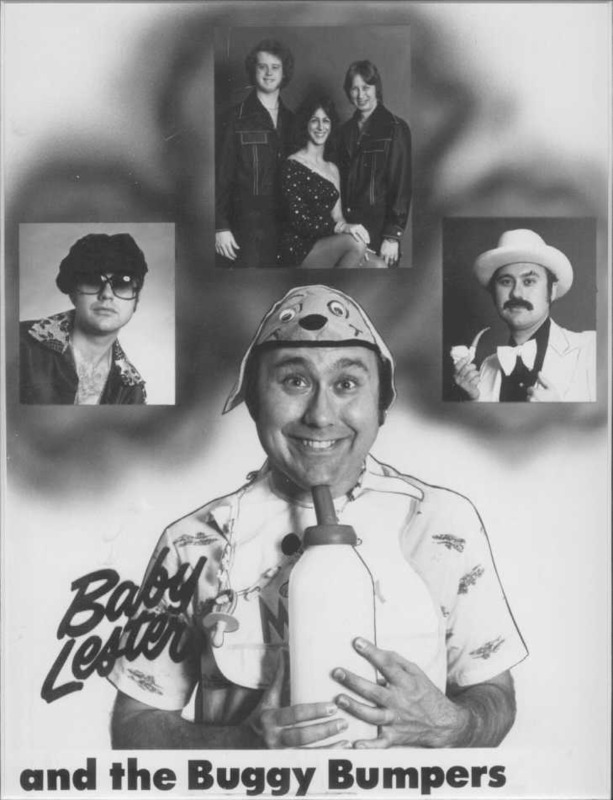 On Halloween Night of that year, I got a call from the legendary Baby Lester in Omaha, beckoning me to join him on the road as a member of Baby Lester and the Buggybumpers. I followed him to Odebolt, Iowa, Independence, Missouri (twice), Fayetteville, Arkansas, Worthington, Minnesota, Albuquerque, Abilene, Atchison, Kansas, Buffalo, Wyoming, Tiffin, Ohio, Pierre, South Dakota, Indianapolis, Wilkesboro, North Carolina, Green Lake, Wisconsin, Detroit Lakes, Minnesota, Humboldt, Iowa and, yes, Kokomo. I'd like to say I never stopped playing. Okay, there were a few stops and starts from time to time -- but I'm playing NOW!! And, yes, I am the brother of marathon champion Mary Burns-Prine, owner of the Women Runners Website and author of The 2008 Women Runners' DAILY JOURNAL & CALENDAR. But I'm determined to make it on the quality of my songwriting, rather than my sister's celebrity, so I pretty much try to keep it a secret. How's that, Mary? You may also order copies of "The Creator," "Hit From Behind," "Forty Years Ago Today," "Mutants That I'll Never Understand," "Undefeated," "Ridiculously High," "Year of the Jumping Flea," "Up Here on the 19th Floor" and "High Adventure on the Road" from the same location!! Check this site often for exciting news about upcoming shows!! 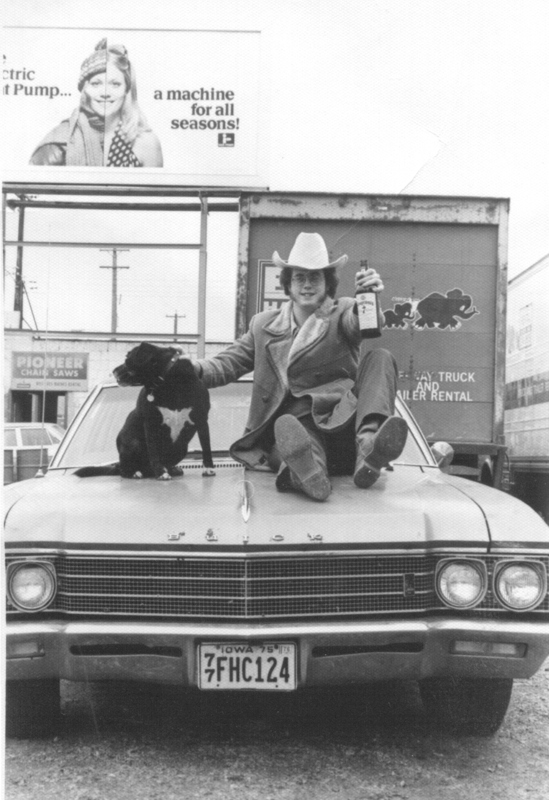 Click here to find out a little more about John Burns, songwriter. 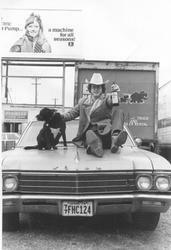 Visit my photo galleries to see some of the people I've worked with over the past forty-some years. Find posters of my upcoming performances. Read my nostalgic accounts of some of my great music business adventures, including the stories about the infamous bad review, some of the more positive publicity I've received, strangers on a train, a little night music, and performing at the 2006 through 2018 IMT Des Moines Marathons. Check out the list of songs played at my performance, and listen to my home-grown demos of about a dozen or so of them. The Village Bean Coffee Co.
Friday, March 4, 2016, 6 to 9 p.m., Private Party, Johnston, IA. Friday, March 11, 2016, 6:30 to 9 p.m. Palek Studio and Gallery, Gallery Night, 506 E. 6th Street, Des Moines, IA. Saturday, March 19, 2016, 10 a.m. to noon, CoffeeCat, 111 South Delaware, Mason City, IA. Saturday, March 26, 2016, 7 to 9 p.m., Friedrich's Coffee, 4632 N.W.86th Street, Urbandale, IA. Sunday, April 3, 2016, 3 to 6 p.m., Annelise Winery, 15110 Highway 92, Indianola, IA. Saturday, April 16, 2016, 2 to 3 p.m., VA Community Center, 3800 30th Street, Bldg. 12, Des Moines, IA. Saturday, April 23, 2016, 10 a.m. to noon, Saints Rest Coffee House, 917 Broad Street, Grinnell, IA. Sunday, May 8, 2016, 1:30 to 2:30 p.m., Iowa Veterans Home, 1301 Summit, Street, Marshalltown, IA. Wednesday, June 1, 2016, 6:30 to 8:30 p.m. Black Forge Coffee House, 1206 Arlington Avenue, Pittsburgh, PA.
Saturday, June 4, 2016, 5 to 7 p.m., Pioneer Mill of Tiffin, 255 Riverside Drive, Tiffin,OH. John returns for one evening to a venue he played for three weeks 39 years earlier with Baby Lester and the Buggybumpers. Wednesday, August 10, 2016, 4 to 7 p.m., Drake Neighborhood Farmers Market, 26th Street South of University, Des Moines, IA. Wednesday, August 31, 2016, 4 to 7 p.m., Drake Neighborhood Farmers Market, 26th Street South of University, Des Moines, IA. Saturday, September 24, 2016, 10 to 11:30 a.m., Firehouse Flea, Des Moines Social Club, 900 Mulberry, Des Moines, IA. The flea market runs from 10 a.m. to 6 p.m. Live entertainment and great art all day long. Saturday, October 8, 2016, 8 a.m. to Noon, Downtown Des Moines Farmers Market, Court Avenue and Fourth Street, Des Moines, IA. Friday, October 7, 2016, 6:30 to 9 p.m. Palek Studio and Gallery, Gallery Night, 506 E. 6th Street, Des Moines, IA. Monday, October 31, 2016, Private Function Out of State. Saturday, November 26, 2016, 7 to 9 p.m., Friedrich's Coffee, 4632 86th Street, Urbandale,IA. Friday, December 2, 2016 11:30 a.m. to 1 p.m., Capital Square Rotunda, Holiday Music Series (although I don't play Holiday Music), 400 Locust Street, Des Moines, IA. Friday, December 23, 2016, 9 to 11 p.m., Ceviche Bar, 223 East Walnut Street, Des Moines, IA. Saturday, December 31, 2016, 4 to 6 p.m., Uptown Bill's Coffee Shop, 730 South Dubuque Street, Iowa City, IA. John plays on New Year's Eve for the first time in 40 years. Friday, January 6, 2016, 9 to 11 p.m., Ceviche Bar, 223 East Walnut Street, Des Mones, IA..
Friday, January 13, 2017, 6:30 to 9 p.m., Palek Studio and Gallery, Pirate Luau, 506 E. 6th Street, Des Moines, IA. Saturday, January 21, 2017, 8:30 to 11 p.m., Streetcar 209, 525 East Grand Avenue, Des Moines, IA. John trades sets on the third Saturday of each month with a featured local songwriter. January's featured songwriter is Rob Lumbard. Saturday, January 28, 2017 10 a.m. to noon, Saints Rest Coffee House, 917 Broad Street, Grinnell, IA. Friday, February 3, 2017, 9 to 11 p.m., Ceviche Bar, 223 East Walnut Street, Des Moines, IA. Saturday, February 25, 2017, 7 to 9 p.m., Friedrich's Coffee, 4632 N.W. 86th Street, Urbandale, Iowa. Friday, March 3, 2017, 9 to 11 p.m., Ceviche Bar, 223 East Walnut Street, Des Moines, IA. Friday, March 10, 2017, 6:30 to 9 p.m., Palek Studio and Gallery, Gallery Night, 506 E. 6th Street, Des Moines, IA..
Saturday, March 18, 2017, 8:30 to 11 p.m., Streetcar 209, 525 East Grand Avenue, Des Moines, IA. John trades sets on the third Saturday of each month with a featured local songwriter. March's featured songwriter is Big Joel Kinser. Friday, March 24, 2017, 9 to 11 p.m., Ceviche Bar, 223 East Walnut Street, Des Moines, IA..
Saturday, April 15, 2017, 6 to 7 p.m., Uptown Bill's Coffee House, 730 South Dubuque Street, Iowa City, IA Live entertainment all weekend celebrating Bill Sackter's 104th birthday. Saturday, April 22, 2017, 8:30 to 11 p.m., Streetcar 209, 525 East Grand Avenue, Des Moines, IA. John trades sets on the third Saturday of each month with a featured local songwriter. April's featured songwriter is Luke Fox. Thursday, April 27, 2017, 5 to 8 p.m., La Poste, 1218 Warford, Perry, IA. Saturday, May 6, 2017 3:30 to 4:30 p.m., Bickford Cottage, 110 Newcastle Road, Marshalltown, IA. Friday, May 12, 2017, 6:30 to 9 p.m., Palek Studio and Gallery, Gallery Night, 506 E.6th Street, Des Moines, IA. Saturday, May 20, 2017, 8:30 to 11 p.m., Streetcar 209, 525 East Grand Avenue, Des Moines, IA. John trades sets on the third Saturday of each month with a featured local songwriter. May's featured songwriter is Randy Kong. Wednesday, May 24, 2017, 5 to 8 p.m., Woody's Smoke Shack, 2511 Cottage Grove Ave, Des Moines, IA. Thursday, June 1, 2017, 7 to 8 p.m., Neutral Ground Coffeehouse, 5110 Danneel Street, New Orleans, LA. Saturday, June 3, 2017, 2 to 4 p.m., Dog Eared Books, 301 West Main Street, Russellville, AR. Saturday, June 10, 2017, 2 to 3 p.m., VA Central Iowa Healthcare System, 3600 30th Street, Des Moines, IA. Saturday, June 17, 2017, 8:30 to 11 p.m., Streetcar 209, 525 East Grand Avenue, Des Moines, IA. John trades sets on the third Saturday of each month with a featured local songwriter. June's featured songwriter is Brian Holtz. Thursday, June 22, 2017 4 to 8 p.m., Valley Junction Farmers Market, 200 East Walkway, West Des Moines, IA. Saturday, June 24, 2017, 7 to 9 p.m., Uptown Bill's Coffee House, 730 South Dubuque Street, Iowa City, IA. Wednesday, June 28, 2017, 5 to 8 p.m., Woody's Smoke Shack, 2511 Cottage Grove Ave, Des Moines, IA. Saturday, July 1, 2017, 7 a.m. to noon, Downtown Des Moines Farmers Market, Fourth and Court Avenue, Des Moines, IA. Wednesday, July 5, 2017, 7 to 11 p.m., Gaslamp, 1501 Grand Avenue, Des Moines, Brother Trucker's First Wednesday of the Month. John Appears as the mid-show guest. Wednesday, July 26, 2017, 5 to 8 p.m., Woody's Smoke Shack, 2511 Cottage Grove Ave., Des Mones, IA. Saturday, August 5, 2017, 7 to 11 p.m., Chocolaterie Stam, 2811 Ingersoll Avenue, Des Moines, IA. Thursday, August 17, 2017, 10 to 10:45 a.m., Mid-American Energy Stage, Iowa State Fair, Des Moines, IA. Thursday, August 17, 2017, 1:30 to 2:15 p.m., Bud LIght Stage, Iowa State Fair, Des Moines. Thursday, August 24, 2017, 4 to 8 p.m., Valley Junction Farmers Market, 200 East Walkway, West Des Moines, IA. Wednesday, August 30, 2017, 5 to 8 p.m., Woody's Smoke Shack, 2511 Cottage Grove Ave., Des Moines, IA. Friday, September 1, 2017, 8 to 9 p.m., Corner Coffee Uptown, 1414 West 28th Street, Minneapolis, MN. Saturday, September 9, 2017, 1 to 6 p.m., The Bird Lady Farmers Market, 16588 NE Street, Cambridge, IA. Thursday, September 14, 2017, Drake Neighborhood Farmers Market, 24th Street between Drake Park Avenue and Cottage Grove, Des Moines, IA. Thursday, September 21, 2017, 4 to 8 p.m., Valley Junction Farmers Market, HVJF Office, 137 5th, West Des Moines, IA. Saturday, September 23, 2017, 7 a.m. to noon, Downtown Des Moines Farmers Market, Court Avenue between 3rd and 4th Streets, Des Moines, IA. Wednesday, September 27, 2017, 5 to 8 p.m., Woody's Smoke Shack, 2511 Cottage Grove Ave, Des Moines, IA. Thursday, October 12, 2017, 4:30 to 7:30 p.m., Drake Neighborhood Farmers Market, 24th Street between Drake Park Avenue and Cottage Grove, Des Moines, IA. Saturday, October 28, 2017, 8 a.m. to noon, Downtown Des Moines Farmers Market, 4th and Court Avenue, Des Moines, IA. Saturday and Sunday, November 11-12, 2017, Art on the Prairie, Perry, IA. Regional artists and acoustic musicians show their work at various locations in historic downtown Perry. John performs from 1 to 2:50 p.m. at Peterson Designs. Saturday, November 18, 2017, 8 to 10:30 p.m., Streetcar 209, 525 East Grand Avenue, Des Moines, IA. John trades sets on the third Saturday of each month with a featured local songwriter. John's guest in November is Aaron Earl Short. Saturday, Novebmer 25, 2017, 7 to 9 p.m., Friedrich's Coffee, 4632 N.W. 86th Street, Urbandale, IA. Saturday, December 16, 2017, 8 to 10:30 p.m., Streetcar 209, 525 East Grand Avenue, Des Moines, IA. John trades sets on the third Saturday of each month with a featured local songwriter. John's guest in December is Andrew Fleming. Saturday, December 23, 2017, 7 to 9 p.m., Friedrich's Coffee, 4632 N.W. 86th Street, Urbandale, IA. Saturday, January 20, 2018, 7:30 to 10:30, The Lucky Pig, 113 West Walnut Street, Ogden, IA. Saturday, February 24, 2018, 4 to 6 p.m., Gazali's Mediterranean Restaurant, 1205 25th Street, Des Moines, IA. Saturday, March 3, 2018, 10 a.m. to noon, Linden Street Coffeehouse, 101 South Linden Street, Lamoni, IA. Saturday, March 10, 2018, 2 to 3 p.m., Iowa Veterans Home, 1301 Summit Street, Marshalltown, IA. Saturday, March, 17, 2018, 6:30 to 8:30 p.m., Java JIve, 221 North Main, Hannibal, MO. Saturday, March 24, 2018, 4 to 6 p.m., Gazali's Mediterranean Restaurant, 1205 25th Street, Des Moines, IA. Saturday, March 31, 2018, 7 to 9 p.m., Friedrich's Coffee, 4632 N.W.86th Street, Urbandale, IA. Saturday, April 7, 2018, 10 a.m. to noon, Linden Street Coffeehouse, 101 South Linden Street, Lamoni, IA. Saturday, April 14, 2018, 6 to 7 p.m., Uptown Bill's Coffee House, 730 South Dubuque, Iowa City, IA. During the weekend of April 11-13, the Iowa City Community celebrates Bill's Birthday Bash 105, in honor of Bill Sackter's 105th birthday. John joins a long parade of performers appearing during the weekend. Monday, May 14, 2018, 7 to 10 p.m., The Bean Counter Coffeehouse and Drinkery, 212 Jefferson Street, Burlington, IA. Thursday, May 24, 2018, 4 to 8 p.m., Valley Junction Farmers Market, Historic Valley Junction Foundation, 137 5th Street, West Des Moines, IA. Saturday, June 2, 2018, 7 a.m. to noon, Downtown Des Moines Farmers Market, SW corner of 4th and Court, Des Moines, IA. Saturday, June 9, 2018, 4 to 6 p.m., Gazali's Mediterranean Restaurant, 1205 25th Street, Des Moines, IA. Saturday, June 16, 2018, 7 to 9 p.m., Uptown Bill's Coffee House, 730 South Dubuque, Iowa City, IA. Wednesday, June 20, 2018, 4:30 to 7:30 p.m., Drake Neighborhood Farmers Market, 24th and Cottage Grove, Des Moines, IA. Thursday, June 28, 2018, 4 to 8 p.m., Valley Junction Farmers Market, Historic Valley Junction Foundation, 137 5th Street, West Des Moines, IA. Saturday, June 30, 2018, Slater Block Party, Slater, Iowa. Saturday, July 7, 2018, 4 to 6 p.m., Gazali's Mediterranean Restaurant, 1205 25th Street, Des Moines, IA. Saturday, July 14, 2018, 7 to 9 p.m., Chocolaterie Stam, 2814 Ingersoll Avenue, Des Moines, IA. Saturday, July 21, 2018 1 to 6 p.m., Gabriel House Sessions: A Community of the Arts, 1701 Pennsylvania Avenue, Des Moines, IA. Wednesday, July 25, 2018, 4:30 to 7:30 p.m., Drake Neighborhood Farmers Market, 24th and Cottage Grove, Des Moines, IA. Saturday, July 28, 2018, 7 to 9 p.m., Chocolaterie Stam, 2814 Ingersoll Avenue, Des Moines, IA. Saturday, August 4, 2018, 7 a.m. to noon, Downtown Des Moines Farmers Market, 4th Street north of Court, Des Moines, IA. Saturday, August 11, 2018, 7 to 9 p.m., Chocolaterie Stam, 2814 Ingersoll Avenue, Des Moines, IA. Monday, August 13, 2018 10 to 10:45 a.m., Iowa State Fair, Bill and Susan Knapp Stage, Des Moines, IA. Monday, August 13, 2018, 1:30 to 2:15 p.m., Iowa State Fair, Bill and Susan Knapp Stage, Des Moines, IA. Thursday, August 16, 2018, 9:30 to 10:15 a.m., Iowa State Fair, Bud Light Stage, Des Moines, IA. Saturday, August 18, 2018, 11 a.m. to 1 p.m., Gazali's Mediterranean Restaurant, 1205 25th Street, Des Moines, IA. Thursday, August 23, 2018, 4 to 8 p.m., Valley Junction Farmers Market, Fifth and Maple Streets, West Des Moines, IA. Friday, August 31, 2018, 6 to 8 p.m., Acoustic Cafe, 77 Lafayette Street, Winona, MN. Saturday, September 8, 2018 11 a.m. to noon, Gazali's Mediterranean Restaurant, 1205 25th Street, Des Moines, IA. Saturday, September 15, 2018, 11 a.m. to 1 p.m., Gazali's Mediterranean Restaurant, 1205 25th Street, Des Moines, IA. Saturday, September 22, 2018, 7 a.m. to noon, Downtown Des Moines Farmers Market, 4th Street north of Court, Des Moines, IA. Thursday, September 27, 2018, 4 to 8 p.m. Valley Junction Farmers Market, Fifth and Maple, West Des Moines, IA. Friday, October 5, 2018, 7 to 9 p.m., JP's 207, 207 West Main Street, Washington, Iowa. Saturday, October 6, 2018, 11 a.m. to 1 p.m., Gazali's Mediterranean Restaurant, 1205 25th Street, Des Moines, IA. Sunday, October 21, 2018, 8 a.m. to noon, IMT Des Moines Marathon, Des Moines, IA. For the 13th year, John plays in front of Butler House. Saturday, October 27, 2018, 8 a.m. to noon, Downtown Des Moines Farmers Market, 4th Street north of Court, Des Moines, IA. Saturday, November 3, 2018, 11 a.m. to 1 p.m., Gazali's Mediterranean Restaurant, 1205 25th Street, Des Moines, IA. Saturday, November 10 to Sunday, November 11, 2018, Art on the Prarie, Perry, IA. John Burns plays at the Security Bank Building on Saturday from 3 to 4:45 p.m.
Saturday, November 17, 2018, 7 to 8 p.m. Marv's Music, 506 East 6th Street, Des Moines, IA. Saturday, December 1, 2018, 11 a.m. to 1 p.m., Gazali's Mediterranean Restaurant, 1205 25th Street, Des Moines, IA. Friday, December 7, 2018 6:30 to 8:30 p.m., University Tap, 7500 University Boulevard, Clive, IA. Saturday, December 22, 2018, Friedrich's Coffee, 4632 N.W.86th, Urbandale, IA. Saturday, December 29, 2018, 7 to 9 p.m., Uptown Bill's Coffee House, 730 South Dubuque Street, Iowa City, IA. Saturday, January 5, 2019, 11 a.m. to 1 p.m., Gazali's Mediterranean Restaurant, 1205 25th Street, Des Moines, IA. Saturday, February 2, 2019, 11 a.m. to 1 p.m., Gazali's Mediterranean Grill, 1205 25th Street, Des Moines, IA. Saturday, February 16, 2019, 7 to 9 p.m., Friedrich's Coffee, 4632 N.W. 86th, Urbandal, IA. Friday, March 1, 2019, 8 to 10 p.m., The Talk Shop Lounge, 3357 St. Charles Road, Saint Charles, IA. Saturday, March 9, 2019, 11 a.m. to 1 p.m., Gazali's Mediterranean Grill, 1205 25th Street, Des Moines, IA. Thursday, March 21, 2019, 5:30 to 7:30 p.m., ShortE's BBQ, 8805 Chamberry Blvd., Johnston, IA. Saturday, March 30, 2019, 7:30 to 9:30 p.m., The Beancounter Coffeehouse and Drinkery, 212 Jefferson Street, Burlington, IA. Saturday, April 6, 2019, 11 a.m. to 1 p.m. Gazali's Mediterranean Grill, 1205 25th Street, Des Moines, IA. Saturday, April 27, 2019, noon to 2 p.m., Living History Farms Farm and Food Festival, 11121 Hickman Road, Urbandale, IA. Activities, including musical performances, all day long. Saturday, May 4, 2019, 11 a.m. to 1 p.m., Gazali's Mediterranean Grill, 1205 25th Street, Des Moines, IA. Saturday, May 11, 2019, 7 to 10 p.m. (or 9 p.m. to midnight for bad weather), Ambro's Roadhouse Bar and Grill, 917 Guthrie Street, DeSoto, IA. Saturday, June 1, 2019, 7 a.m. to noon, Downtown Des Moines Farmers Market, Fourth Street North of Court Avenue, Des Moines, IA. Saturday, June 15, 2019, 7 to 9 p.m., Uptown Ankeny Farmers Market, 715 W. 1st Street, Ankeny, IA. Saturday, June 22, 2019, 11 a.m. to noon, Gazali's Mediterranean Grill, 1205 25th Street, Des Moines, IA. Saturday, June 29, 2019, 7 to 9 p.m.,Chocolaterie Stam, 2814 Ingersoll Avenue, Des Moines, IA. Saturday, July 6, 2019, 7 to 9 p.m., Chocolaterie Stam, 2814 Ingersoll Avenue, Des Moines, IA. Saturday, July 20, 2019, 8 a.m. to noon, Uptown Ankeny Farmers Market, 715 W. 1st Street, Ankeny, IA. Saturday, July 27, 2019, 11 a.m. to noon, Gazali's Mediterranean Grill, 1205 25th Street, Des Moines, IA. Saturday, August 3, 2019, 7 a.m. to noon, Downtown Des Moines Farmers Market, Fourth Street North of Court Avenue, Des Moines, IA. Saturday, August 17, 2019, 8 a.m. to noon, Uptown Ankeny Farmers Market, 715 W. 1st Street, Ankeny, IA. Friday, August 30, 2019, 6 to 8 p.m., Acoustic Cafe, 77 Lafayette Street, Winona, MN. Saturday, September 14, 2019, 8 a.m. to noon, Uptown Ankeny Farmers Market, 715 W. 1st Street, Ankeny, IA. Saturday, October 26, 2019, 8 a.m. to noon, Downtown Des Moines Farmers Market, Fourth Street North of Court Avenue, Des Moines, IA. If YOU want to receive email announcements about my upcoming performances, send me your email address!! Leave a note in my guest book, so I can see who's been visiting my site. You can now visit me on Facebook and check out my Electronic Press Kit!! And I'm available to play at YOUR event or venue at a price affordable to ANY budget! !